Forget takeout! 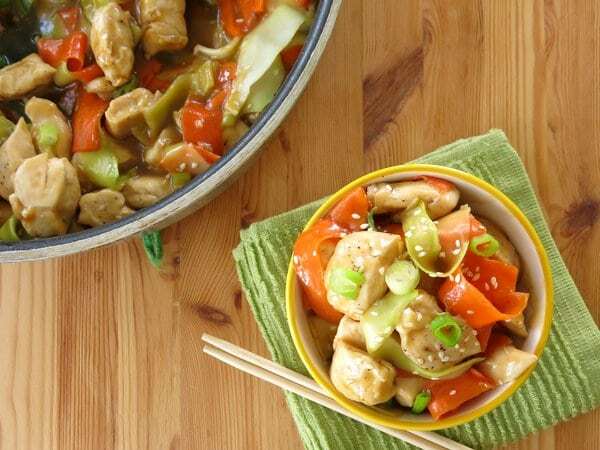 This Chinese Orange Chicken recipe is ready in less than 30 minutes and has a finger-licking good sauce that can be made as spicy as you like it! The nice thing about preparing a dish, that you might otherwise order out, is that you control the quality and amount of the ingredients, such as the type of chicken. You can adjust the amount of heat. We like our sauce just a teensy bit spicy. I gave a range for the heat. I’m on the low-end. If you like it hot, and you know who you are, then add the full amount of red pepper flakes. And, if you don’t like hot and spicy, leave the flakes out entirely. Another important substitution we make at our house is coconut aminos in place of soy sauce. Not only does this ingredient make the dish soy-free, but it also ensures that it is gluten-free too. As for the sweetness, a full 3 Tablespoons of honey is what you’d expect at a restaurant. But, I can easily be satisfied with a smaller amount (like about 2 Tablespoons) if I’m trying to shave off a few calories. Combine first 5 ingredients in a small bowl and set aside. Add chicken pieces to pan and cook for about 2-3 minutes on each side or until no longer pink. Mix corn starch and water together in a small bowl. Add sauce and corn starch slurry to pan with chicken and toss to coat chicken. 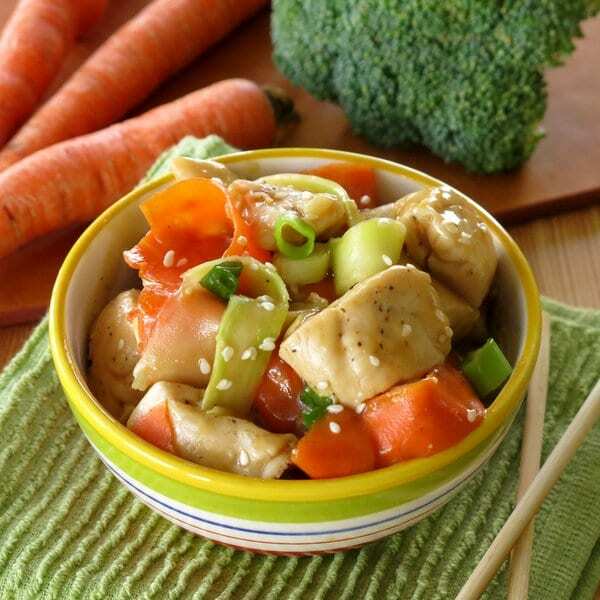 Add broccoli and carrot ribbons to pan and stir to coat with sauce. Yep. always have OJ in the fridge! Finger-licking good is right – looks awesome! Love this dish – and especially that the chicken isn’t breaded and fried like at so many Chinese restaurants! Thanks for sharing a great dinner idea! I always enjoy making takeout recipes at home. I feel so much better knowing exactly what I’ve put in the recipe and taking control over the portions. Great job with this one! 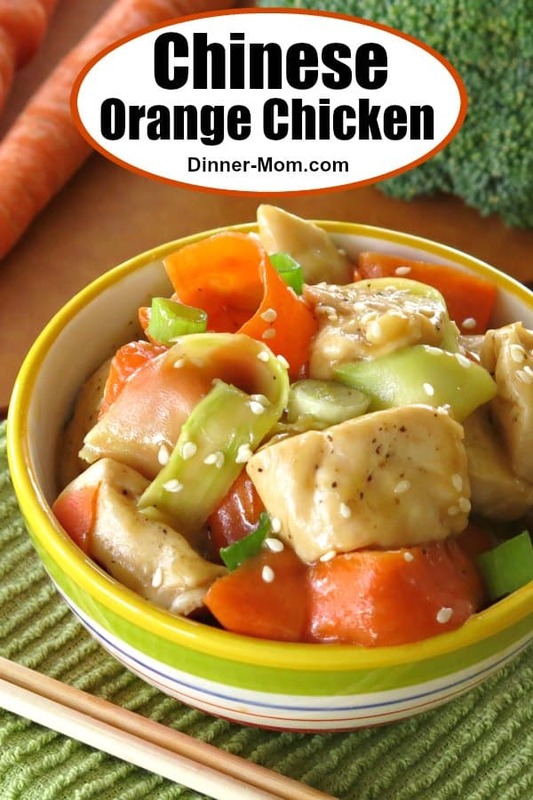 Orange Chicken is something that I can get my whole family to eat – and yours looks amazing (plus it makes me remember that it’s been far too long since we’ve had some). I will try your recipe next time I put it on the menu…thanks! Making homemade meals is always a good choice. I love the glaze in your recipe. Sounds delicious! I’m with you on always having orange juice in the fridge;) Comes in handy when I make dishes like this! My recipe is similar, except I have to try next the pretty carrot ribbons. 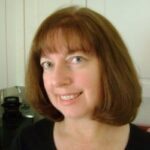 Looks great, Marjory! I love takeout fakeout night!!! 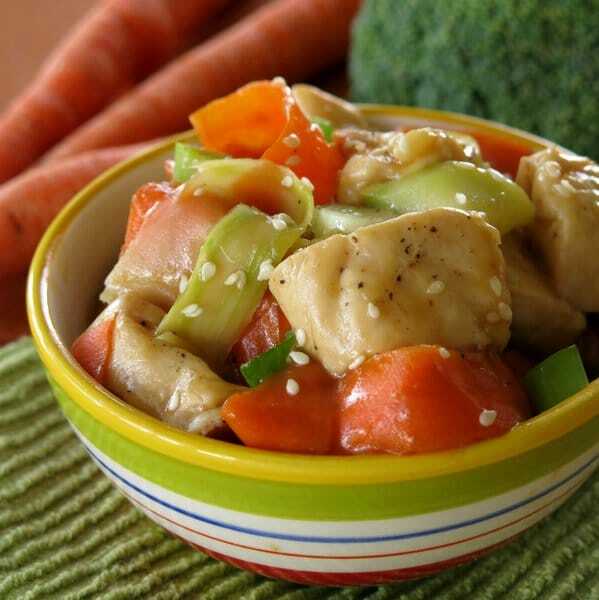 This orange chicken looks delicious! I love easy dinners that I can make at home that are SO much better than takeout. This recipe looks delicious! Love it!c lean and simple! Orange chicken is my favorite! Take out Fake Out is the best! I love orange chicken! 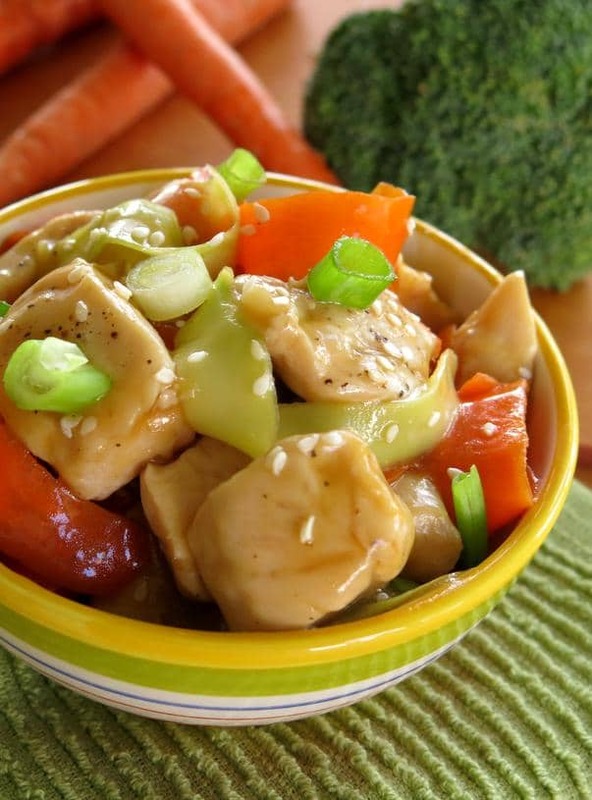 I also love making my take on Chinese cuisine at home, so this dish is perfect! Orange juice and honey? I love it! Sounds simple enough for me! I am craving chinese now! My boyfriend would love this! I’m going to put this on my to-make list. My kids will LOVE this. I can’t wait to make it for them! I really love this. I love the chicken isn’t breaded like other recipes I’ve tried. Not that I’m against breaded chicken, but this is such a much healthier alternative to a favorite. LOVE! I love Chinese take out but never know what they’re putting in there. this is the perfect make at home dish! My whole family will love this – thank you!! I am totally loving how legit this looks! This looks like such an easy weeknight option!